I speak to you not as a doctor, scientist, or toxicologist, but as an educated consumer. Just like you, I want to create a home that is comfortable, enjoyable, and safe. Think of me like a friend or neighbor, sharing homemaking tips across the fence or over a cup of tea. You can also consider me to be a mentor—an experienced and knowledgeable advisor who can show you the way to do something, in a field that can be confusing and overwhelming. By allowing me to guide you through unfamiliar territory, you will be able to learn more quickly and easily for yourself how to make your own decisions regarding toxic chemicals. This book contains information I have gathered regarding choices you can make that can improve your health. I am not a medical doctor and I am not giving you medical advice. The information in this book has not been evaluated by the FDA. Nothing in this book is intended to diagnose, treat, cure or prevent any disease, disorder, pain, injury, deformity, or physical or mental condition. Individual results may vary. In this book I am simply sharing with you knowledge I have gained from extensive research and personal experience, which has helped me and others I know improve our health. I believe if you apply the information in this book in your own life, you can improve your health too, but to do so is entirely your choice and the consequences of doing so, or not, are entirely your responsibility. Occasionally in this book I make suggestions for using products in ways other than those for which they were originally intended. Because government regulations do not allow manufacturers to recommend their products for certain uses without laboratory proof that they are indeed safe and effective for such uses (and then procuring government approval of the results), these alternative uses are not necessarily approved by the manufacturer. Not all the suggestions given are guaranteed to work for everyone, but all have been found to work for many people. This book is designed to serve people with different interests, budgets, medical conditions, and lifestyles, and as such it may occasionally make recommendations that are not appropriate for you. 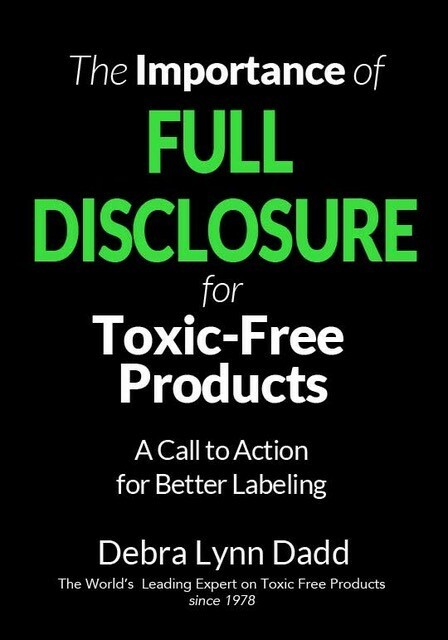 At these times, simply make an individual choice, and remember that the book’s primary purpose is to make you aware of the toxic dangers in your home and the environment and suggest toxic-free alternatives. Because your body is unique, you alone must make the decisions regarding how you take care of it. My intent in writing this book is simply to offer you information that will help you in your own choice to be toxic-free.